Age of Wolves celebrates the one year anniversary since the launch of For Honor. This season will focus on gameplay and stability with major hero updates, global fight changes, new training features and the long awaited arrival of dedicated servers. It's been a long wait but they're finally here. After a lot of hard work, the For Honor team is happy to announce the implementation of Dedicated Servers in Season 5 Age of Wolves. It will be deployed on all PvP game modes and enhance the experience for all warriors. Dedicated servers will be released on PC on February 19 (date subject to change), while release on console is expected at a later date. We Need Your Feedback! Please make sure to report any bugs and send us your feedback on our dedicated forum page. With all the factions at even strength in Season 5, the team focused their efforts on some major updates to heroes of the current roster as well as global fight changes affecting overall gameplay. After listening to community feedback, both the Kensei and Conqueror movesets have been updated with new moves and animations to increase their efficiency on the battlefield. 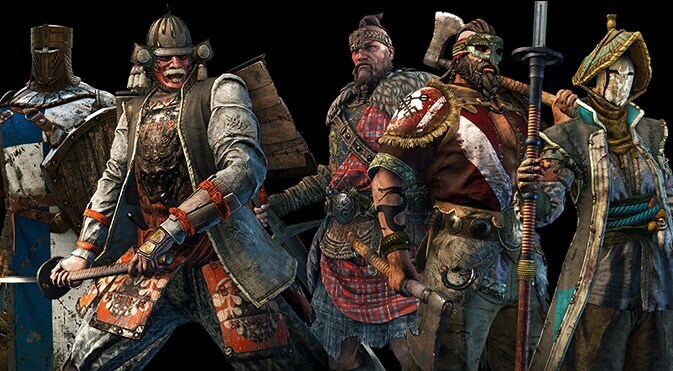 In addition, some major balancing updates have been made on the Berserker, Nobushi and Higlander. In an effort to lower the prevalence of defensive behavior in PvP combat, the team has also updated the fight system for players to aim for a more offensive mindset. Turtles beware! Season 5 gives players more options when it comes to player progression with the introduction of refined gear and XP boost. For all players looking to maximize their Gear sets further, you can now do so with a new layer to your crafting: Refined Legendary weapons and armor. Now players will be able to spend their Salvage (gathered by dismantling gear) in exchange for an XP boost that you can apply before any match. Hone your skills in For Honor's new Training Mode. Learn the basics of the art of battle in our apprentice and warrior trials as a newer player to the game. For seasoned veterans looking to take their game to the next level, take a step into the arena mode and practice against specific Heroes and moves. Practice makes perfect. Players are now able to equip different effects on each of their executions and emotes slots. 4v4 Ranked play in Season 5 will now be available through Tribute. Strategic Points have now been added to the World Map. Owning a territory that has a strategic point, will grant bonuses for either XP, loot and war assets. A new reason to fight in the Faction War! Cancels to side attacks now happen 200ms later. All Light Finishers now have Uninterruptible Stance. Cancel to Dodge now only happens at the same timing as the Side Cancels and Feint timing. Can now be cancelled into Guard Break. Top Heavy Finisher has a new animation. Developer Comments: By changing the timing of the cancels, we will reduce the huge gap between "will it be a side attack or will they actually let the Unblockable fly". Now opponents should have 200ms less to figure out what the proper defense is. The Light Finishers now all gain Uninterruptible Stance, to make more trading situations favor the Kensei. Before, the Dodge was really important because there were a lot of attacks that could easily guess the Kensei’s mix up. While we’ve made a change to the Dodge so that the timing is no longer variable, this timing should be good enough to use Forward Dodge to catch opponents who are Rolling away. The new animation was used because we wanted the Cancels to look better and having the jump made this difficult (but fear not, this animation lives on! See “NEW MOVE Nature’s Wrath” below). 1st Top Heavy can now be cancelled into 1st Side Attacks, Dodge and the new Melee move “Pommel Strike”. 2nd Top Heavy can now be cancelled into 2nd Side Attacks, Dodge and Guard Break. 1st Top Heavy strike is now 1000ms (was 700ms). 2nd Top Heavy strike is now 1000ms (was 700ms). 1st Side Light, when cancelled from 1st Top Heavy, has a strike of 500ms (the regular 1st Light strikes from idle are still 600ms). 2nd Side Light, when cancelled from 2nd Top Heavy, has a strike of 500ms (the regular 2nd Light strikes are still 600ms). 3rd Light strikes are now 500ms (were 600ms on Top, and 700ms on Side before). This applies to the cancelled versions and regular versions. For the recoveries of Light Attacks, switched the input priority so that it checks for Heavy Input first. This means it should be slightly easier to perform a “Heavy into Light Cancel” than it would have been before when it looked for Light Input first. Dodge Cancels can now only be performed while Kensei has Stamina. 1st Side Lights are now 12 damage (were 20 damage). 2nd Side Lights are now 16 damage (were 20 damage). 3rd Side Lights are now 20 damage (were 25 damage). 1st Top Heavy is now 40 damage (was 30 damage). 2nd Top Heavy is now 40 damage (was 20 damage). Developer Comments: Kensei’s identity is based around the Top Heavy Finisher and its mix ups – so we have extended this concept to now "mix up" throughout the chain. This should allow Kensei to attack opponents more successfully. These Top Heavies were made into longer attacks to make these inputs easy for Kensei players, and make the cancelled attacks clear-but-difficult for opponents to deal with. 1st Top Heavy can now be cancelled into an Unblockable "Pommel Strike". Developer Comments: This Melee move is meant to crack turtlers. This lets the Kensei players have a solution to people who are dedicated to blocking everything. We put it only in the 1st Top Heavy Mix-ups, so that they're not so accessible that the Kensei’s can spam these safely. Heavy, Light, Light chain added. Heavy, Light, Heavy chain added. Heavy, Heavy, Light chain added. Light, Heavy, Light chain added. Developer Comments: These new chains all still follow the “3 hit chain” concept, and mean that the Kensei’s can perform any combination of Lights and Heavies for 3 hits. Remember that the “Light Finishers” gained “Uninterruptible Stance” and are faster than they were, so there should be situations in which they are a good option. (Note that these chains use the same attacks as seen in the existing chains. They’re not new attacks, they’re new branching’s, and are meant to give the Kensei’s more room to be creative in how they put pressure on their opponents). 1st Top Heavy, now causes "Heavy Hit/Block Reaction" (was Medium). 2nd Heavy in the Chain, from any direction, now causes "Heavy Hit/Block Reaction" (was Medium). Developer Comments: This means that the opponent will spend more time in “Hit/Block Recovery”. This means that, for example, if you hit with a 2nd Heavy and then go to the “Top Heavy Finisher”, they cannot launch a 500ms attack in time to counter the Top Heavy Finisher. But if your 2nd Heavy is blocked, they have a little more time to counter your “Top Heavy Finisher” with a 500ms attack, but you still can trade with the “Side Light Finisher”, “Side Heavy Finisher”, or beat it with a “Dodge Superior Block”. “Swift Strike” is now performed with the Heavy Input Button. “Swift Strike” is now considered a Heavy Attack, allows Executions, cost 12 Stamina (was 6), and a suffer Heavy Parry penalty. Developer Comments: This means that the opponent will spend more time in “Hit/Block Recovery”, making the Top Heavy Finisher mix up safer. You can still go to your Light Finisher or Heavy Finisher afterwards. “Helm Splitter” is now considered a "Light" attack again, and is interrupted when blocked. “Helm Splitter” damage is now reduced to 17 (from 20). Developer Comments: We made this Uninterrupted on Block way back in Patch 1.08.01, with the hope that it would let the Kensei’s reach the “Top Heavy Unblockable”. It didn’t make the Kensei much stronger in 1v1 as hoped – instead it seems only really useful in group fights. With a stronger “Top Heavy Unblockable” mix up, we think we can make this interrupted when blocked again. Performed by pressing "Dodge Forward into Heavy". Visualized as overhead strike (using the old “Top Heavy Finisher” animation). Developer Comments: This move is meant to catch opponents who attempt to roll away from the “Top Heavy Unblockable” mixup. This is much slower than “Helm Splitter”, so it being Uninterrupted on Block should not be overly punishing in group fights. Forward dodge's Superior Block phase now starts from 100ms to the end of the dodge, and now is always in the Top Stance. Right dodge's Superior Block phase now starts from 100ms to the end of the dodge, and now is always in the Right Stance. Left dodge's Superior Block phase now starts from 100ms to the end of the dodge, and now is always in the Left Stance. Can perform your dodge attacks after Superior Blocking an attack (even if it’s late in the dodge). Helm Splitter now can only be launched starting at 100ms (was starting at 300ms). Grasping Pounce now can only be launched starting at 100ms (was starting at 0ms). Developer Comments: Before, the Kensei’s could get a Superior Block while dodging - but it was extremely hard to perform, because it meant they had to spend time to Stance Change to the correct stance, and then Dodge. This change is meant to make this much easier to perform. The longer time of the Superior Block will also mean that opponents, who try to counter your “Top Unblockable Heavy” with their top light attack, are going to be beaten by your “Forward Dodge Cancel” into “Grasping Pounce” and punished. The change to make the forward dodge attacks start later is to avoid ‘Rewind’ problems, and to better control the Kensei's range for Guard Break. When it was at 0ms, it allowed slightly more range to a Guard Break than expected, leading to "the best way for Kensei to do a regular Guard Break is to actually press Forward + Dodge + Guard Break extremely quickly", which is not intended. Zone Attack has been reworked into a 3-strike attack. The first strike is 500ms, from Left Stance, hitting your locked target – and then flows into a similar version of the old zone attack for the second and third strikes. Zone Attack no longer has Uninterruptible Stance. All strikes now have increased knockback when in Revenge. Developer Comments: The Kensei’s Zone Attack struggled to find a role before – it was too slow and weak to be good in a due, and the weird hit areas and timings made it extremely difficult to use effectively in group fights. Since it now starts with a fast side attack, it should find a use in duels, and with the increased knockback and ability to hit forward first, we would like it to be able to find a role in group fights as well. The loss of Uninterruptible Stance was made to avoid trading in duels, but if you use it in a group fight you can use the Revenge's Uninterruptible Stance and be more effective in clearing opponents around you. Removed the bump after the Strike. [Bug Fix] Throwing an opponent into another opponent now causes the same bumped reaction as any other heroes' throws do. Charged Heavies are now Unblockable. There is no "Uncharged", "Level 1 Charged" and "Fully Charged" version anymore - it's either fully charged or it's a regular heavy. A pink flash will show when it's fully charged. The "Charged Finisher" has been removed. Top Heavy Unblockable is 800ms, and does 44 damage. Side Heavy Unblockable is 700ms, and does 33 damage. The Stance Change while charging is now 100ms (was 300ms). Conqueror can no longer launch a Light Attack while charging. Has Immunity to Guard Break starting at 100ms into the strike. Developer Comments: Charged Heavy Opener was in a very strange spot before - it was easy to reach because it had Conqueror's passive Superior Block defense, but was easy for the opponent to block too. So now, we added risk by taking away the defense and added reward by making it Unblockable. We removed the Light option to streamline what this hero is about - conceptually, we're trying to position the Conqueror to have significantly different feelings while in the various states - regular mode, charging mode, full-block mode - and making fighting against them in these states have clearly different feelings. We removed the various levels of charging because it's now extremely clear if the Conqueror has charged his attack and what his options are, whereas before it was all exactly the same. Conqueror no longer has passive Superior Block. It has been replaced with the same Regular Block properties as the rest of the roster. Full Block Stance (see next entry below). Developer Comments: Conqueror has enjoyed the ability to Block and follow with a free Guard Break against many characters' heavy attacks. The ability to get a guaranteed Guard Breaks off a simple Block was too good - the Conqueror risked nothing and got a huge benefit. It also shut down many opponents from being able to use heavies. While we take away the passive Superior Block, by having it on the states listed above, the feeling of being a Heavy should remain, but now Conqueror will take some risks to get those benefits. All Heavies can be cancelled into the new move "Shield Uppercut". Does 10 Stamina damage . “Shield Uppercut” can do damage if the feat “Shield Basher” is active. Hit Recovery is 700ms (was 800ms), and you get Stance Change / Default Defense at 600ms. Miss Recovery is now 700ms (was 600ms), and you get Stance Change / Default Defense at 600ms. Developer Comments: Conqueror's Charged Heavies are easily dodged - but with this Melee as a Cancel option, it should help punish people who you correctly predict will do a side dodge. Hitting with this move guarantees a follow-up of a Light Attack. Developer Comments: Conqueror had a real problem where if you hit with a Basic Light Opener, you could only do another Light, but that hardly ever worked. Also, if Conqueror hit with a Heavy, you had to do either do a Shield Bash Mix Up or Heavy…but these had basically the same long timing. Consequently, Conquerors mostly only took their guaranteed damage after a Shield Bash, but then stopped attacking. We don't want you to have to stop attacking because of how unlikely your options are to work – so we improved the chain rules to help Conquerors sustain their attack. Top Basic Light Attack's strike is now 500ms (was 600ms). Light Infinite Strikes are now 500ms (were 600ms). All Light Attacks do 15 damage (were 12). Removed Full Block Stance cancel from all Light strikes. Developer Comments: Cancelling the fastest attacks was causing Flicker and rollback issues, so this is why we removed it from the Light strikes. We kept the ability to enter Full Block Stance from the Heavy attacks, and from Light and Heavy recoveries. When successfully Blocking an attack from Full Block Stance, Conqueror can now connect to new move “Flail Uppercut”. Conqueror no longer can Shield Bash Riposte, Dodge, or basic Attack during Full Block Stance, or Full Block Stance Exit. Conqueror can Zone Attack from Full Block Stance. Full Block Stance defense is now considered Superior (was Regular). Full Block Stance Entry is now 300ms (was 200ms). Full Block Stance Exit is now 200ms (was 400ms). Stamina cost for entering Full Block Stance is now 20 (was 6). Stamina regen cooldown after Full Block Stance has been removed (was 4.0s). Stamina cost for blocking an attack from Full Block Stance has been made 0, no longer regen stamina during these blocks, and Conqueror no longer is unbalanced when blocking and going out of stamina. Developer Comments: In keeping with the general philosophy of risk/reward on this character, now if you block something from Full Block Stance, you can punish them with a “Flail Uppercut” (see “Flail Uppercut” below). The intention is that this is now something you use to punish predicted attacks with rather than a safe way to turtle. “Flail Uppercut” replaces Shield Bash Reposte. “Flail Uppercut’s” strike is 500ms (Shield Bash Riposte was 800ms). Developer Comments: This move is intended to be guaranteed after successfully predicting an attack from Full Block Stance. We feel that since the Conqueror is taking a risk with Full Block Stance, Conqueror deserves to land good damage as the reward. Shield Bash Riposte did not do a good job to help Conqueror counter-attack so Flail Uppercut has been build specifically for that purpose. After a hit, branching to Light Attack is now at 400ms (was at 0ms). After a hit, branching to Heavy Attack and Full Block Stance are now at 400ms (were at 300ms). Shield Bash Mix Up is slightly better at tracking opponents who dodge sideways. Shield Bash now does 10 stamina damage (was 20). Immune to Guard Breaks property now starts at 100ms. Hit Recovery is now 700ms (was 800ms), and you get Stance Change / Default Defense at 600ms (before you could perform any action at 600ms). Miss Recovery is now 700ms (was 600ms), and you get Stance Change / Default Defense at 600ms (before you could perform any action at 400ms). You do get the ability to launch Light Attack, Heavy Attack, and Full Block Stance at 300ms. Developer Comments: After the Shield Bash Mix Up, you are still guaranteed the Light Attack - but no longer guaranteed the Heavy Attack unless you hit them into a wall. Note that all the Shield Bashes on the Conqueror now do 10 stamina damage - this is to move Conqueror away from sapping the opponent's stamina, as the Conqueror is now better positioned as a mix of hard-hitting offense, and predictive defense with good punishes – rather than trying to be a stamina bully. Forward Dodge now branches to Shield Bash from 100ms-500ms (was 300ms-500ms). Forward Dodge now branches to Full Block Stance from 600ms (was 800ms). Forward Dodge can now branch to attack options, including Guard Break, from 600ms (was 800ms). After a hit, all branching’s start at 100ms (some were at 0ms, some 300ms, some 600ms). Light Attack is still guaranteed after a Shield Bash. Reduced Shield Bash attack range on Front Dodge to 1.25m (from 1.5m), and from Side Dodge to 1.25m (from 2.0m). Increased forward movement by 1.0m. Shield Bash knockback reduced by 0.8m, to reduce the situations in which you whiff the following Light attack. Miss Recovery is now 700ms (was 600ms), and you get Stance Change / Default Defense at 600ms (before you could perform any action at 400ms). Developer Comments: Light Attack is still a guaranteed follow-up if the Shield Bash hit. Heavy Attack is no longer guaranteed. Movement changes should result in no significant change in function – we reduce part and increase another part so that it visually looks better, but reaches the same distance. The Hit recovery is now 300ms longer. The Hit recovery no longer forces Conqueror into Out Of Lock. The Hit area reduced horizontally. Charging Shield Crush now does 10 stamina damage (was 0). Charging Shield Crush now moves the opponent 0.5m further backward. 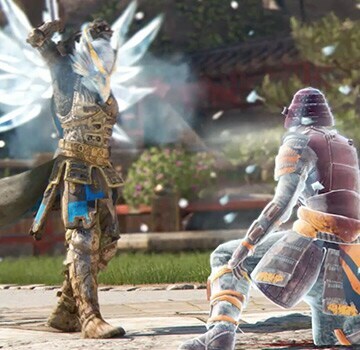 Developer Comments: Before, the Conqueror was able to hit the opponent, but because the opponent was in the Get Up animation, the opponent does not react to the hit. The opponent could then get an Uncounterable Guard Break on the Conqueror. Now, the Conqueror doesn't get any guaranteed damage after a Charging Shield Crush. With the new timing, opponents will be up in time to block. 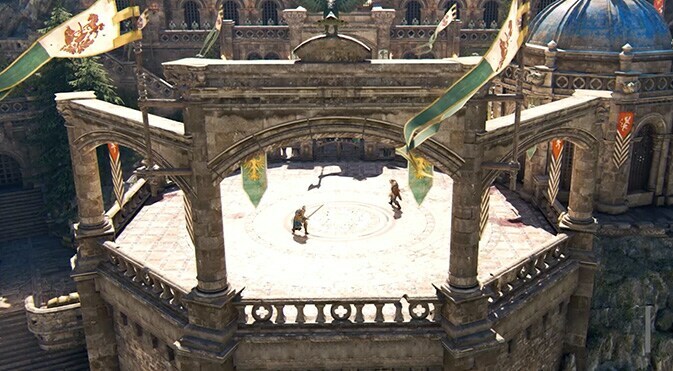 We want this move to be good in group fights, and in certain situations where the opponent is near a ledge, but not something Conquerors would want to rely on in duels. Top Heavy is now 33 damage (was 25). Developer Comments: Top Heavy is longer than Side Heavies and so isn't guaranteed on Guard Break or after a Flail Uppercut. To help the Conqueror earn the ‘Hard Hitter’ moniker, we also increase the damage on this Top Heavy opener. When activated from Full Block Stance, we removed a 100ms gap on startup where the Conqueror had no defense. Conqueror now can be Parried properly on the 2nd or later hit. Conqueror is no longer interrupted by blocking a minion strike. Developer Comments: Since this is considered Superior Block during the attack, the Zone Attack isn't stopped when blocking an incoming attack. Opponents are expected to beat it with an Unblockable, a Melee, or just walk up and Parry it on their Left side. The Top Strike can now be Cancelled into Fast Flow to Top Offensive Form, by holding the Heavy Input Button - shows the pink flash of entry in Offensive Form. Slightly increased rotation of Top Strike to better track sprinting opponents. Improved ability to acquire targets that are sprinting at the Highlander. “Celtic Curse” can now switch targets when cancelling to the side attacks. Developer Comments: “Celtic Curse” needs to be strong so that Highlander can initiate combat, and here the cancel into Offensive Form will make the real attacks much harder to identify, while protecting the Highlander from the Full Block Stance of Conqueror or Warlord. Removed the stamina cooldown for entering Offensive Form. Can now regen stamina while dodging in Offensive Form. Reduced stamina cost of “Balor's Might” to 24 (from 30). Developer Comments: The Highlander has been heavily limited by his stamina consumption and regen. Often, the Highlanders would do a lot of work to only get one hit in, then have to back off. Now, the Highlanders should be more able to sustain their offensive. Note that while Offensive Form's Enhanced Lights still cost 3 stamina when cancelled from “Balor's Might”, when accessed directly they are reduced from 33 to 27. Increased damage on Offensive Form “Balor's Might” to 40 (from 30). Increased damage on Defensive Form Side Heavy Openers to 35 (from 25). Increased damage on Defensive Form Side Heavy Finishers to 35 (from 30). Increased damage on Defensive Form Top Heavy Opener to 45 (from 40). Increased damage on Defensive Form Top Heavy Finisher to 45 (from 40). Developer Comments: Part of the Highlander's fantasy is to hit hard and now he finally can. Uninterruptible Stance is now applied to Defensive Form's 2nd Lights, starting at 100ms. Interrupt Blocked reaction is reduced to 800ms (was 1100ms). Developer Comments: This move no longer gives up a free Guard Break when blocked. Furthermore, the Uninterruptible Stance allows it to be used occasionally in-group fights. Improved ability to move forward during the strike. Developer Comments: “Caber Toss” is now better able at catching players who are attempting to dodge. The intention is to improve the “Fomorian Kick” and “Caber Toss” mix-up, especially against back-dodges (and diagonally backward dodges). Increased movement on Offensive Form's Forward Dodge by 0.25m. 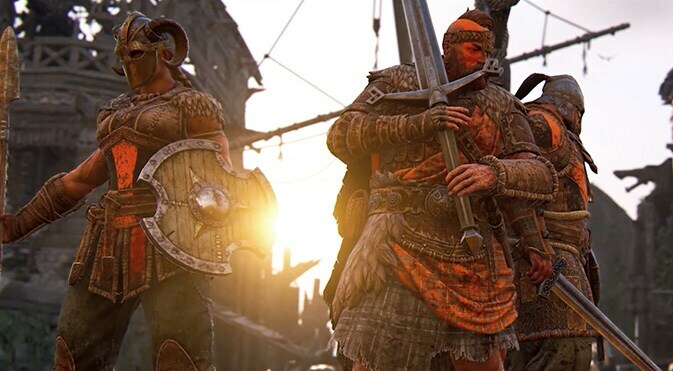 Developer Comments: Small movement increase to help Highlander catch up to more opponents while holding the Offensive Form. [Bug Fix] Removed a loop of “Kick into Forward Dodge, repeat”, by removing the 100ms early connection from kick-to-dodge. [Bug Fix] Reduced the knockback distance slightly on “Formorian Kick”, in order to reduce the situations in which you land the kick, but then whiff the Unblockable Heavy afterward. [Bug Fix] Fixed an issue where Stance Change prevented Highlander from Fast Flowing into Offensive Form. Reduced the knockback of Predator’s Hunger by 0.5m. Left Throws no longer Unbalance the opponent if the Throw itself reduces them to 0 stamina. It now only Unbalances if the opponent was at 0 stamina before the Throw (this now makes it consistent with other heroes’ throws). 1st strike: Reduced to 20 damage (from 33 damage). 2nd strike: 1 + 20 bleed damage (from 6 damage+ 20 Bleed damage). Total = Reduced to 41 health damage (from 59 health damage). [Bug Fix] Added visual effect on Zone attack 2nd strike cancel. Kick startup reduced to 600ms (from 800ms). On Heavy the branching to Kick was delayed by 100ms. Updated the attack range to 3.5m (from 4m). [Bug Fix] Reduced invulnerability to Guard Break by 400ms on Miss (was from 0 to 700ms, now from 0 to 300ms) and by 300ms on Hit (was from 0 to 600ms, now from 0 to 300ms). Developer Comments: Now when the Nobushi misses her Kick, the opponent is able to Guard Break her. Removed the stamina cost on hit (10 stamina points). Kick trajectory has been updated. “Hidden Stance” Top Light attack startup reduced to 500ms (from 600ms). [Bug Fix] Defense was missing during the last 100ms of the Feint. It is fixed. [Bug Fix] Feints could be performed while Out of Stamina. It is fixed. [Bug Fix] Inside chains, the Nobushi can move horizontally during all her Top attack startup, which allows her to dodge the Block into Shove for example. It is fixed. Developer Comments: Now the Nobushi cannot move on side direction during her chain top attacks, she only move forward as the other chains in the game. Increased the Nobushi side dodge recoveries durations to 600ms (Before was 500ms). [Bug Fix] Nobushi Cobra Strike can hit an opponent without any visual contact when opponent succeed a dodge. It is fixed. Developer Comments: The trajectories were updated to be closer to the “Cobra Strike” animations. [Bug Fix] Nobushi was unable to cancel the Cobra Strike’s Recovery into a forward Dodge. It is fixed. Developer Comments: It was not allowed to make a forward dodge during the “Cobra Strike”, only side dodges were allowed. Now, the Nobushi can cancel “Cobra Strike” by a forward or a side dodge. [Bug Fix] The Nobushi sprint light attack allows opponent to go through the guidance while the Sprint heavy doesn’t. Sprint Light no longer causes the opponent to be knocked off ledges. Sprint Heavy now causes the opponent to be knocked off ledges. [Bug fix] The Nobushi can perform “Slithering Thrust” and “Coiling Slash” while out of stamina with the “Iron Lungs” feat active. It is fixed. Developer Comments: Now the Nobushi has the same behavior as the other characters which share the same feat. She cannot perform her sprint attacks. Reduced the damage to 8 damage (from 18). Developer Comments: Light attacks post “Hidden Stance” into Light (combo) now confirms 34 (instead of 44) damage. Removed the ability to cancel “Sidewinder Form” recoveries by a back dodge. Can only be cancelled by a Front or a Side Dodge. Developer Comments: Same behavior than the “Cobra Strike”, will avoid to be able to escape. You can now Counter Guard Break if grabbed during a Parry Reaction. Parrying now moves you 1m forward (was 0m). Controller rumble on parry has been fixed. Heavy Parry Reaction is now 1500ms (was 1400ms), and now allows Stance Change during the last 100ms. If you Parry a Heavy, now you get 600ms frame advantage in which your opponent cannot block, parry or dodge. Developer Comments: This means any hero can land a guaranteed Light Attack. Some heroes can also land certain other special moves. Light Parry Reaction is still 1800ms but now allows Stance Change during the last 100ms. If you Parry a Light, now you get 900ms frame advantage in which your opponent cannot block/parry/dodge. Developer Comments: This means most heroes can land a guaranteed Heavy Attack. Some heroes can also land certain other special moves. Added a Visual and Audio Effects to parrying a Light Attack, to indicate that your opponent will be vulnerable for a longer period than if you parried a heavy. Now, if you are parried you can Counter Guard Break. The opponent will still be given a window to strike you, so you’ll still take damage, but the amount is much more reasonable compared to what the original attack that was parried would have done. We also think this will improve the pace of the Parry – before the Parry was usually followed by the Guard Break, which seemed to slow the pace of combat. Now, the Parry will be followed by an actual weapon-based attack and combat should feel a little more dynamic. Removed early connections from Parry to Light Attack and Heavy attack. Developer Comments: We left Berserker’s dedicated Parry follow-up “Skilled Slash” as it was. We removed the specific early connections to attack because Berserker always got a Top Heavy, and now Berserker only gets a Top Heavy after Parrying a Light. This is more in line with the rest of the cast’s options. Fast-flow to Offensive Form from Parry now starts at 700ms into the Parry (was 600ms). Developer Comments: This change is so that if the Highlander Parries a Heavy, it does NOT guarantee a “Fomorian Kick”. Instead, Highlanders should use their Light Attacks against Heavies. If the Highlander Parries a Light, “Balor’s Might” will be guaranteed. Counterattack Heavy now starts at 500ms into the Parry (was 400ms). Counterattack Zone Attack now starts at 500ms into the Parry (was 400ms). Developer Comments: Although there’s a change here, Lawbringer has exactly the same parry rewards as on before. These timing changes are just a consequence of the general Parry changes made above. Reduced Top Light to 15 damage (from 17). Reduced Top Light 2nd Combo Strike to 7 damage (from 15). Increased “Wind Gust” to 35 damage (from 25). Increased “Riptide Strike” to 40 damage (from 30). Developer Comments: The Orochi’s Top Light into Top Light Combo damage output is reduced to 22 (from 32), so that it is in line with the rest of the rosters punishes when parrying a Heavy. Orochi is compensated with better damage on the special counter-attack moves. Reduced backward movement during Parry Reaction to match other heroes. Developer Comments: This is so heroes with low range attacks can still connect, such as Warlord’s Top Light. Reduced forward movement during parrying to 1m (from 2m), to match other heroes. Shugoki used to be able to act 700ms into the 800ms Parry. Now, Shugoki can launch Light, Heavy or Zone Attacks at 600ms, but must wait until 800ms to perform other moves like Dodge, Guard Break or “Demon Embrace”. Skill-based team balancing is now live! After matchmaking completion, a new balancing phase is added to the game before the players join the lobby. The teams will now be balanced towards the best composition through the players’ skill rating. Note: in this first implementation, the balance is only based on the players’ skill, not their renown (or other parameters). This will only affects new game sessions being created. Joining a game in progress or in the end lobby will not go through the team balancing phase. Developers comment: This is a highly anticipated feature and we’re happy to introduce it to you. It will help greatly to balance the teams composition, improve the fun and quality of the matches. Please note that this is the first version. We are already working on additional team balancing improvements to push the quality even further. Skirmish now uses a pulse respawn mechanic. Developers comment: This means that all dead players will respawn simultaneously every 10 seconds, with a minimum of 3 seconds. This should make it much easier for teams to regroup after losing team fights, which in turn should make the whole game mode fairer. To supplement this change, executions will no longer inflict a respawn duration penalty and will instead give more hard points based on the duration of the execution (Short: 15 pts, Medium: 35pts, Long: 50 pts). This should ultimately create shorter and more intense matches that feel more like what a Skirmish should be. Community orders rewards will only be given to players participating towards the order’s goal upon completion. Example: As a community, perform 10000 executions in Dominion matches. – The player has to execute at least one enemy in a Dominion match while the order is active to receive the rewards. Developer Comments: In order to encourage everyone to partake in the community orders, we decided to reward only those whose effort directly contribute towards the common goal. This was part of the original intents of the feature and we felt unfair for the players that did not participate in the community order just log in and get the rewards. This mean only players who participated by directly increasing the community order goal during its duration will be eligible for the reward, should it be completed. All actions taken before or after the completion of the order will not count as participation. All actions taken during the order that do not contribute towards the order’s goal will not count as participation. Strategic Territories are selected faction war territories giving a bonus to the Faction that controls them. The bonus given by the territory depends on its type. There are 3 types of Strategic Territories (Mill, Forge, Castle). Each type gives a different bonus and is represented by a specific model on the world map. Conquering an enemy Strategic Territory will transfer access to the Bonus to the new controlling Faction. At the beginning of each Campaign, each Faction controls an even number of each type of Strategic: 2 Mills, 1 Forge, 1 Castle each. The type & positioning of Strategic Territories will not change during the season. Each Mill controlled by a Faction gives a 5% bonus on the base XP at the end of matches. Base XP includes XP from Hero Actions, Match Completion, and XP Bonus if there’s any. Represented by a Windmill on the map. Each Forge controlled by a Faction increases the Loot Rate of gear by 7% at the end of matches. Represented by a Forge on the map. Each Castle Territory receives 10% more Troops from their controlling Faction. The bonus only applies to manually placed Troops, so Troops assigned by War Banner or by hand between matches. Each Castle Territory is independent and controlling multiple Castles territories does not increase their individual bonuses. Represented by a Faction-Themed Castle on the map. 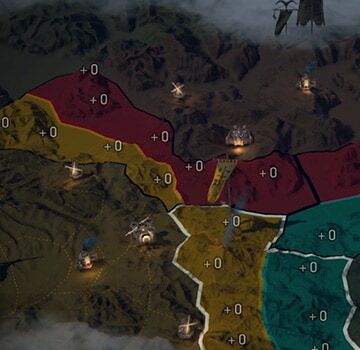 Developer’s comments: We want to give a new level of strategy to the Faction War by adding Strategic Territories. They give concrete mid and long-term objectives, as well as rewards to player’s participation during the Campaign. Mills & Forges give access to more resources, whereas Castles give important strategic footholds by making territories easier to defend. 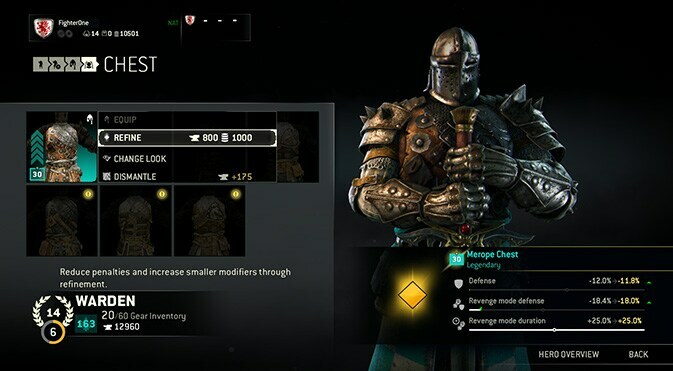 This is another step in improving the value and depth of the Faction War. [Improvement] Capital territories are now restricted to 1 territory per faction. All previous gain of capital territories are reverted to normal territories. Only remaining capital territory with statue cannot be taken. Developers comment: Following the addition of the strategic territories, we reverted the capital territories gained with Faction War Season victories to make sure the map stays balanced and fair. [Bug Fix] Fixed an issue that caused Territories to receive Troops from the wrong Faction after a specific Battle resolution. Max reputation level increased from 40 to 50. Each reputation levels come with an outfit as rewards. Developer Comments: With more people reaching the max reputation and new XP progression, we introduced more levels to bring a new objective to high-level players. Players can now trade salvage for XP Boosts. XP Boosts can be used before the match to grant extra XP for the player and their teammates at the end of a match. An XP boost provides a flat value of 250 extra XP for the player and 50 extra XP for every teammates. Developer Comments: Since the different factions materials have been merged together, the community has been asking for another use of their salvage. We heard the claims and we believe that the XP Boost will not only help you with that but also with a faster progression. This allows players to control their progression; use high-level heroes salvaged gear to fuel low-level heroes progression and adds a social aspect with the shared boost. XP boost cost increments with each purchase to a ceiling. The XP boost cost resets every day. Developer Comments: We settled on an incremental price to make the XP boost accessible for a multitude of players while safeguarding against excessive usage, which would have created a groove in the player base’s progression speed. We want players with a low amount of salvage in bank but with one or more high level heroes to easily access a few XP boost per day with their loot while also giving an interesting option for those with huge amount of salvage to gain advantage from their resource. Having an incremental cost protects us from people simply consuming a huge amount of XP boost using scavenger crates to bypass the progression and getting too much of an advantage from the feature. Just like Orders, the objective is to reward player commitment and those who play everyday should get the most of the XP boost feature. Following the addition of the strategic points, end of match rewards were rebalanced to give value to the Mills while keeping same or better default XP income. XP gained on a Dominion (PVP) match win at the start of the Campaign changed from 500 XP to 506 XP. XP gained on a Tribute (PVP) match win at the start of the Campaign changed from 400 XP to 396 XP. XP gained on a Skirmish (PVP) match win at the start of the Campaign changed from 500 XP to 506 XP. XP gained on an Elimination (PVP) match win at the start of the Campaign changed from 400 XP to 396 XP. XP gained on a Brawl (PVP) match win at the start of the Campaign changed from 300 XP to 297 XP. XP gained on a Duel (PVP) match win at the start of the Campaign changed from 260 XP to 264 XP. XP gained on a Duel Tournament (PVP) match win at the start of the Campaign changed from 360 XP to 363 XP. XP gained on a Dominion Ranked (PVP) match win at the start of the Campaign changed from 500 XP to 506 XP. XP gained on a Dominion (PVP) match lost or tied at the start of the Campaign changed from 380 XP to 385 XP. XP gained on a Tribute (PVP) match lost or tied at the start of the Campaign changed from 300 XP to 297 XP. XP gained on a Skirmish (PVP) match lost or tied at the start of the Campaign changed from 380 XP to 385 XP. XP gained on an Elimination (PVP) match lost or tied at the start of the Campaign changed from 300 XP to 297 XP. XP gained on a Brawl (PVP) match lost or tied at the start of the Campaign changed from 220 XP to 220 XP. XP gained on a Duel (PVP) match lost or tied at the start of the Campaign changed from 190 XP to 187 XP. XP gained on a Duel Tournament (PVP) match lost or tied at the start of the Campaign changed from 260 XP to 264 XP. XP gained on a Dominion Ranked (PVP) match lost or tied at the start of the Campaign changed from 380 XP to 385 XP. XP gained on a Dominion (PvAI) match win at the start of the Campaign changed from 400 XP to 396 XP. XP gained on a Tribute (PvAI) match win at the start of the Campaign changed from 320 XP to 319 XP. XP gained on a Skirmish (PvAI) match win at the start of the Campaign changed from 400 XP to 396 XP. XP gained on a Elimination (PvAI) match win at the start of the Campaign changed from 320 XP to 319 XP. XP gained on a Brawl (PvAI) match win at the start of the Campaign changed from 240 XP to 242 XP. XP gained on a Dominion (PvAI) match lost or tied at the start of the Campaign changed from 300 XP to 297 XP. XP gained on a Tribute (PvAI) match lost or tied at the start of the Campaign changed from 240 XP to 242 XP. XP gained on a Skirmish (PvAI) match lost or tied at the start of the Campaign changed from 300 XP to 297 XP. XP gained on an Elimination (PvAI) match lost or tied at the start of the Campaign changed from 240 XP to 242 XP. XP gained on a Brawl (PvAI) match lost or tied at the start of the Campaign changed from 170 XP to 165 XP. XP gained on a Dominion (PvAI - Matchmaking Off) match win at the start of the Campaign changed from 250 XP to 253 XP. XP gained on a Tribute (PvAI - Matchmaking Off) match win at the start of the Campaign changed from 200 XP to 198 XP. XP gained on a Skirmish (PvAI - Matchmaking Off) match win at the start of the Campaign changed from 250 XP to 253 XP. XP gained on an Elimination (PvAI - Matchmaking Off) match win at the start of the Campaign changed from 200 XP to 198 XP. XP gained on a Brawl (PvAI - Matchmaking Off) match win at the start of the Campaign changed from 150 XP to 154 XP. XP gained on a Duel (PvAI - Matchmaking Off) match win at the start of the Campaign changed from 130 XP to 132 XP. XP gained on a Dominion (PvAI - Matchmaking Off) match lost or tied at the start of the Campaign changed from 190 XP to 187 XP. XP gained on a Tribute (PvAI - Matchmaking Off) match lost or tied at the start of the Campaign changed from 150 XP to 154 XP. XP gained on a Skirmish (PvAI - Matchmaking Off) match lost or tied at the start of the Campaign changed from 190 XP to 187 XP. XP gained on an Elimination (PvAI - Matchmaking Off) match lost or tied at the start of the Campaign changed from 150 XP to 154 XP. XP gained on a Brawl (PvAI - Matchmaking Off) match lost or tied at the start of the Campaign changed from 110 XP to 110 XP. XP gained on a Duel (PvAI - Matchmaking Off) match lost or tied at the start of the Campaign changed from 90 XP to 88 XP. Developer Comments: With the introduction of the Strategic Points, we had to rebalance the rewards to take in account the points that each faction has on its territory at the start of the season. This does not decrease the XP income; it, at the minimum, matches the rewards that we had in the previous season or improves them. 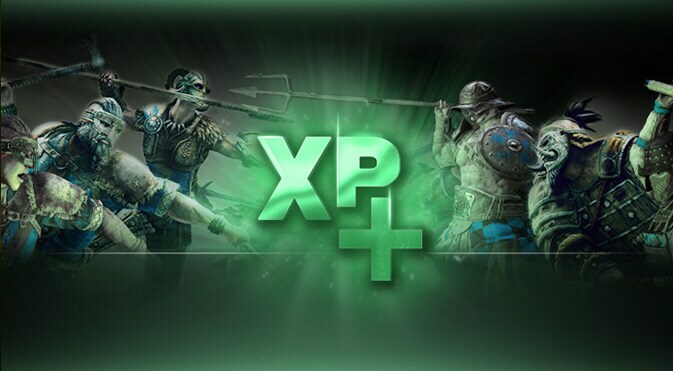 Note that the Strategic Points bonus (and other percentage bonuses, like XP Fest and Champion Status) are applied after the calculation of the match XP. Refinable gear are new pieces of gear, not updates on current weapon and armor parts and must be looted. Refined gear parts has a potential extra crafting level, available only on rare Legendary gear stat bundles. Meaning some Legendary gears can be Refined after they hit their maximum crafting level. The bonus gained from Refining is different from normal crafting and varies per bundles. Refining decreases penalties and only increases small bonuses while normal crafting increases all bonuses and penalties at the same time. Refinable gears have a chance to drop whenever you loot a Legendary gear for a Hero of Reputation 9 or higher. The chances to gain a Refinable gear increases with their reputation level. Refinable gears do not affect gear score, so the gear score cap is not be affected. Refined gear is instead displayed as diamonds above gear icon. When a full set of gear is refines (all weapons and all armor pieces), the diamond is displayed in the character overall gear score. Developer Comments: We added a new option of gear progression for the players who reached high Reputation levels on their Heroes without impacting negatively the progression when starting an Hero from scratch. 4 new Legendary Weapons visuals have been introduced for all Heroes. Players are now able to equip a different effect to each execution and emote slot. Developer Comments: Continuing with the hero improvements, we added more options for you to further customize the executions and emotes, and rock those effects on the battlefield. Non-playable Heroes (locked Heroes) are now greyed out in the Heroes Grid to increase the visibility on which heroes can be picked in the current match. The Reporting dialog also includes the “Do and Don’t” of reporting in a selected category. Reports are reviewed on a daily basis, and we will continue to monitor For Honor for inappropriate behavior, as well as take action as needed to preserve the integrity of game. You may refer to our code of conduct here: Code of Conduct. Please Note: Abuse of this feature can lead to Sanctions against the Reporter. Furthermore, the ability to report each player is now limited to once per match. Developer Comments: Thanks to this, players will be able to report toxic behaviors more accurately. It’s crucial for us to have a safe and fun environment when playing For Honor. We are committed to continue fighting against toxicity in our game. With a Controller: While Holding (View/Share) press (Menu/Options) to switch to the Interactive Scoreboard. With Keyboard & Mouse: Press F5 to access the Interactive Scoreboard directly. Developer Comments: Now players will find it easier to interact with a specific player name during a match. Improved multi-threaded rendering which allowed us to fix a number of issues related to display mode changes (e.g. transition from fullscreen to minimized). Additionally the command line /nothreadaffinity is enabled by default, which solves the stutter issue some players encountered that forced them to disable a CPU core. Heroes can now be rotated in any Customization menu screen while using a mouse. To do so, players need to click and drag the Right Mouse Button on the Hero. Please note: The previous rotation in the “Preview” screen was achieved with the Left Mouse Button; this is now changed to the Right Mouse Button for consistency. The Current V-Sync selection box has been extended to include “Adaptive” as a separate entry. Available options now are: Off, Double Buffering, Adaptive, Triple Buffering. [Improvement] Updated the camera orientation control to provide a better control to the player. [Bug Fix] Fixed an issue that allowed the player to teleport to his target after launching an attack during the Snowball emote. [Improvement] Zone Attack recovery is now 900ms (was 1000ms). [Bug Fix] Fixed an issue that caused the Warden weapons pop after Guard Break into Push Forward. [Bug Fix] Fixed an issue that caused the right arm of the Warden to pop during “Hilt Strike” execution. [Bug Fix] Fixed an issue that caused the execution 'Dislocator' to be offset while performing on the female Conqueror. [Bug Fix] Updated the move set page of the Raider in the Campaign. In the campaign, you can cancel heavy attack with a light attack but you cannot cancel “Raider Fury” with a Light attack it is only possible in PvP, so we have removed this false information. [Bug Fix] Fixed an issue that caused the Shinobi to be interrupted by a Guard Break from an external attacker during the teleport behind his opponent after a deflect. Developer Comments: This was inconsistent compared to other characters deflect. Now, a Guard Break cannot interrupt the Shinobi during all his teleport (when he is invisible) and during the 1st part of his recovery (before he starts to turn in the direction of his target). [Bug Fix] Fixed an issue that cause the Shinobi to send the opponent in the wrong direction after performing Charged Kick mix up while he is not locked to him. Developer Comments: The rotation speed of the target was too slow and do not have time to face the Shinobi when he hits him. Now the rotation speed is changed to allow the target rotation to face the Shinobi. [Bug Fix] Fixed an issue that caused the Shinobi Guard Breaks to sometimes affect the opponent behind his targeted opponent. [Bug Fix] Fixed an issue that caused the Centurion to be bumped when using his “Jab” on an opponent from behind. [Bug Fix] Fixed an issue that caused the Centurion to be unable to change stance during the end of Hit and Block Recoveries. [Bug Fix] Fixed an issue that caused the Gladiator Sprint Attacks to misses when the opponent is standing against a wall. [Bug Fix] Fixed an issue that caused the Gladiator "Fighting Dirty" execution to allow the Player to rotate camera throughout execution. [Bug Fix] Fixed an issue that caused the Gladiator shield to go offset when countering Guard Breaks. [Improvement] Modified Guard Break entry animations, as well as added a new repulsion animation for shoulder tackles on unbalanced opponents. [Bug Fix] Fixed an issue that caused the Shaman to be able to cancel “Mountain Lions Power” with a dodge or soft cancel it into a Guard Break when out of stamina. [Bug Fix] Fixed an issue that caused the “Pounce” to not connect on an Out of Stamina opponent that has his back against a wall. 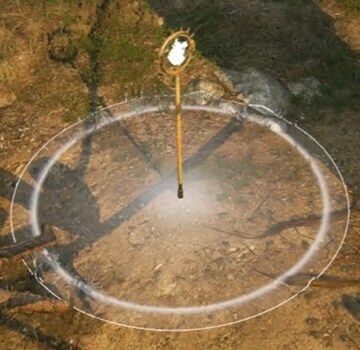 [Improvement] Aramusha’s Throw will now be able to go in diagonal direction depending on the input. [Bug Fix] Fixed an issue that caused the Aramusha to automatically block an Unblockable attack after a Deflect. [Bug Fix] Fixed an issue that caused the move set description of the "Twin Vipers" to refer to “Push Back Kick” input. [Bug Fix] Fixed an issue that caused the “Tireless” feat to not work. This feat now provides the player with 10% Stamina Cost Reduction on all stamina requiring actions. Developers comment: The 10% stamina cost reduction does not apply to stamina damage received by other entity such as players and traps. It should be noted that this value effectively permits the player to feint moves like "Raider Fury" one more time before running out of stamina. This is true even with max gear. [Bug Fix] Fixed an issue that caused the Samurai Bow feat would not face the target if the opponent dodges too early. [Improvement] Moved the Duel location from the Bridge to the Courtyard Platform. [Improvement] Tower Ruin, in the Tribute game mode, has been changed to provide a more interesting experience. Respawners, Offerings and Shrine placements have been moved and Ziplines were added at the top of the tower. [Bug Fix] Fixed many issues regarding the navigation of the Shipyard map. [Bug Fix] Fixed an issue that caused a conflict in between Ziplines and other interactive objects such as Offerings and Revives. [Bug Fix] Fixed an issue that caused the player to be unable to interact with Shrines while an Ally is standing in front of it. [Bug Fix] Fixed an issue that caused Ziplines to become unusable if an Offering is dropped in front of it. [Bug Fix] Fixed an issue that caused the Duel Tournament menu to sometimes become unusable. [Improvement] Orders are now refreshed within 5 minutes after the previous ones closing time or after playing a match. [Improvement] Updated Map Overviews for most Skirmish and Elimination to better represent the placements of the Boosts. [Improvement] Prevented the player idle detection from triggering while the game is paused in menus during PvAI duel or PvAI with “No Matchmaking”. [Bug Fix] Fixed an issue that caused the player to sometimes remain stuck in Tactical View for the whole game. [Bug Fix] Fixed an issue that caused the Emote symbol to be displayed instead of Outfit bundle on all Legacy Outfit bundles in the store. [Bug Fix] Fixed an issue that caused the user interface to display that Bots are “On” while playing PvP Duels. [Improvement] After the community request, The Frost Wind Festival Viking Mask has been reworked and improved visually. [Improvement] Did some changes to the characters' facial system. Everybody should look more lively! [Improvement] The coin toss emote of the Aramusha can now be properly cancelled. [Improvement] Reseting the pitch camera angle to default position when locking on no target while performing an emote. [Bug Fix] Fixed material change on various arms (Gunteric, Procyon, Theudis, Fury, Stalkers) of the Berserker. [Bug Fix] Fixed missing paint pattern (Heat Waves 1) on the Berserker outfit Reputation 31. [Bug Fix] Fixed various symbols and paint patterns on the Warlord outfit Reputation 4. [Bug Fix] Fixed wrong paint pattern (Fire Eye, Target) on the Warlord outfit Reputation 6. [Bug Fix] Fixed missing paint pattern (Vertigo 1) on the Warlord outfit Reputation 35. [Bug Fix] Fixed the thumbnail of the Bone Reign Hatchet Blade of the Shaman is that was misaligned in Barrack. [Bug Fix] Fixed the clipping issues of the Hatchet Blade with some chest (Nightfox, Tundra Warrior, Forest Mystic) for the Shaman while in the barrack. [Bug Fix] Fixed the outfit thumbnail for the Orbital Vortex battle outfit for the male Conqueror. [Bug Fix] Fixed the unlock condition for the outfit Reputation 36 for the Vikings. [Bug Fix] Fixed an issue that caused the sound of the weapon clashing to be lower than expected. [Bug Fix] Fixed an issue that would cause the bots to fail using “Marked for Death” and “Chilling Stare”. This affects the Kensei’s and Raider’s Bots. [Bug Fix] Fixed an issue that caused the Aramusha’s Bot chained Side Heavies to not flow into Side Heavy Finishers if they Hit. [Improvement] Improved bot defense efficiency against Shinobi Heavy Full Charged Attack. [Bug Fix] Fixed an issue that caused the Valkyrie Bot to initiate Sprint Attack too early. [Bug Fix] Improved check for outdated Intel drivers. This is also used to notify users to update their drivers. [Bug Fix] Fixed the description of the "Quick Chat” option which was not clear enough on the actual purpose of the option. [Bug Fix] Removed duplicate loadouts boxes while hovering over the Boxes in the Hero Selection menu. [Bug Fix] Fixed an issue that caused the game to sometime crash on Windows 8.1 after Quit To Desktop via Menu or Alt+F4.